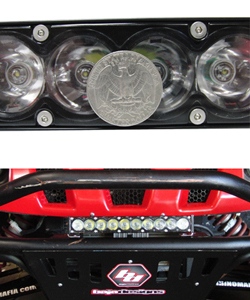 The Baja Designs Stealth is the next generation of LED lighting. Standing a stealthy 1.5″ tall and producing 3500 lumens of light (per 10″ bar) it outperforms competitive products in a package half the size and 1/3 the weight. Features include in-house designed custom TIR reflectors to optimize optical efficiency and give precise and customizable beam patterns. The Stealth utilizes the most efficient LED currently available, the CREE XP-G, with color temperature and output selected for the best off-road performance. The integrated Atmel microprocessor provides dimming and strobe modes as well as advanced thermal management to maximize light output and LED life. Baja Designs patented housing design gives the lamp extreme durability and the unit is completely waterproof. Beam patterns are fully user customizable and the hard-coated polycarbonate front face is incredibly durable and easily replaceable. Baja Designs is so confident in the constructions of this unit that they offer a Lifetime Warranty to back it up. The Stealth is available in 10 to 50 inch lengths and starts at just $429.95.